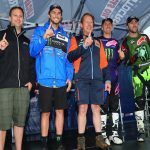 Between Monster Energy Supercross, MotoAmerica and MotoGP, this past weekend hosted a lot of racing. The MotoGP race was rather uneventful compared to Argentina, with Marc Marquez cruising to an easy win at COTA. 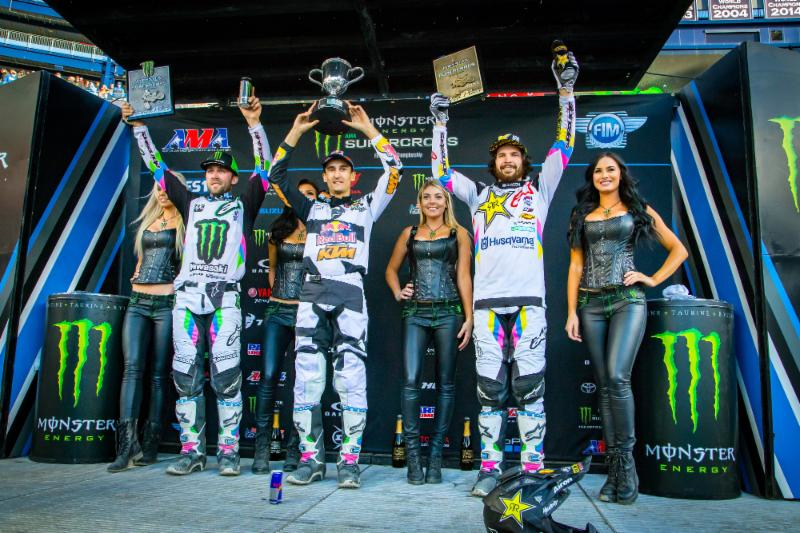 What MotoGP lacked in drama this weekend, Monster Energy Supercross picked up. The 450SX main event was typical with Marvin Musquin, Eli Tomac and Jason Anderson running 1-2-3, until a pair of last lap passes between Tomac and Musquin left Tomac in the dirt (video below). 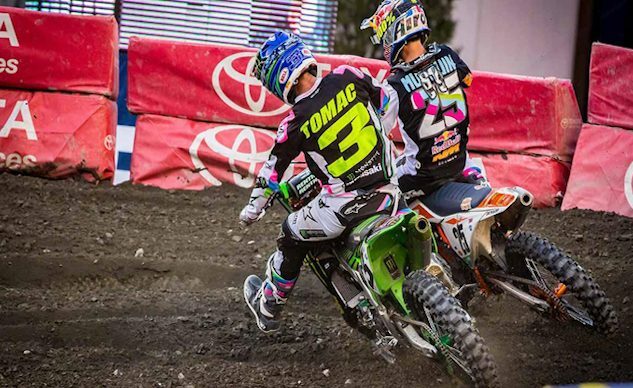 Tomac was still able to get going and finish second, but not without a chip on his shoulder. This coming weekend in Salt Lake ought to be interesting, that’s for sure. In the 250SX class, Rockstar Energy Husqvarna Factory Racing’s Zach Osborne led from wire to wire and was able to extend his points lead. 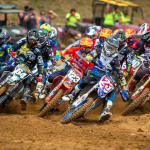 FOXBOROUGH, MA – April 21, 2018 – Monster Energy AMA Supercross, an FIM World Championship, returned to Gillette Stadium after a two-year hiatus for Round 15 in front of 38,404 fans. 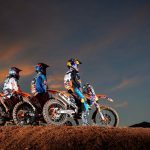 Team Red Bull KTM Factory Racing’s Marvin Musquin dominated the first 22 laps of the Main Event until Monster Energy Kawasaki Racing’s Eli Tomac made his move and found the lead before the white flag. Musquin returned on the last lap with a race-winning pass to take the overall victory. 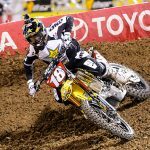 Rockstar Energy Husqvarna Factory Racing’s Jason Anderson rounded out the podium after a third-place start and holds a 34-point lead heading into the second-to-last race of the season in Salt Lake City. 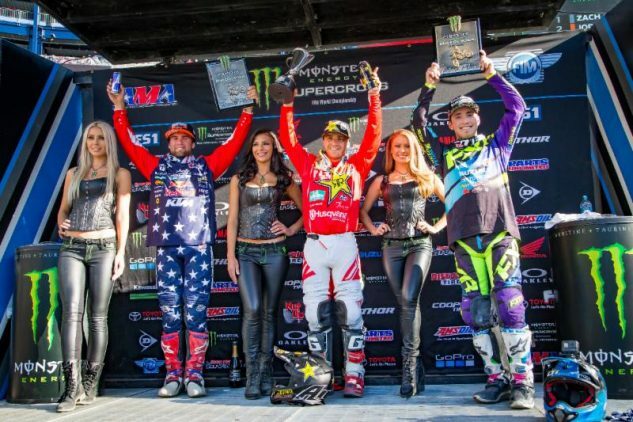 Marvin Musquin notched his third 450SX Class win of the season in Foxborough leading 22 of the 23-Lap Main Event. Photo credit: Feld Entertainment, Inc. In the penultimate round of the Eastern Regional 250SX Class Championship, Rockstar Energy Husqvarna Factory Racing’s Zach Osborne earned his seventh-career victory and first lead-from-the-start Main Event win of the season ahead of Troy Lee Designs/Red Bull/KTM’s Jordon Smith and Autotrader/Yoshimura/Suzuki Factory Racing’s Kyle Peters, who earned his first podium since 2013 with a third-place finish. GEICO Honda’s Jeremy Martin battled from a dead-last start and hammered his way up to fourth place after the 17-Lap Main Event. Osborne holds a 15-point lead heading into the Dave Coombs Sr. East-West Showdown at the season finale in Las Vegas. Zach Osborne dominated his third Eastern Regional 250SX Class win in Foxborough by leading from the start. Photo credit: Feld Entertainment, Inc. Earlier in the day, five-time Monster Energy Supercross Champion Ricky Carmichael appeared alongside New England Patriots star and five-time Super Bowl Champion Rob Gronkowski in a media event where Gronkowski addressed rumors around his future at Gillette Stadium and announced his debut for Monster Energy Supercross. 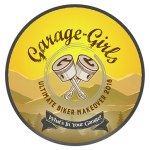 The 2018 Monster Energy Supercross season continues in Salt Lake City with the penultimate Round 16 on April 28 at The University of Utah’s Rice-Eccles Stadium. Watch the action live on FOX at 5:30 p.m. ET.